With his distinctive vocal range and a gift for composing soulful Hawaiian songs, Kalani Pe'a is one of Hawai'i’s brightest new stars. 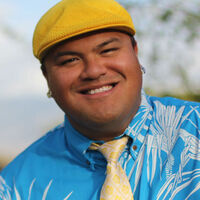 His 2017 debut album, E Walea, won the Grammy Award for Best Regional Roots Music Album, making Kalani the first Hawaiian recording artist to ever win in the category. Influenced from an early age by classical and R&B music, Kalani blends his soothing melodies and powerful ballads with hauntingly gorgeous harmonies and resonant lyrics—creating a musical style all his own, delivered with the passion, poetry and soul of Hawai'i.